Waterfowl and gull season is here! All those pretty little warblers and thrushes have headed south to warmer climes, but that doesn't mean the party's over. In fact, this could be one of the best times of year for bird observation, if you can stand a little cold weather. I realize non-birders may not get too excited about ducks and gulls – cuz they're all the same, right? -- just ducks and seagulls. Right? More than 25 species of ducks, alone, may be found in the open waters of the lagoons at Presque Isle, the bay and the lake. With plumage and variations rich in color and variety, waterfowl can be distinguished from one another with just a little bit of looking. Regularly seen are red-breasted, common, and hooded mergansers; white-winged, black, and surf scoters; American coots, ruddy ducks, northern shovelers, redhead, canvasback, long-tailed and ring-necked ducks, greater and lesser scaup, and blue-winged and green-winged teal. 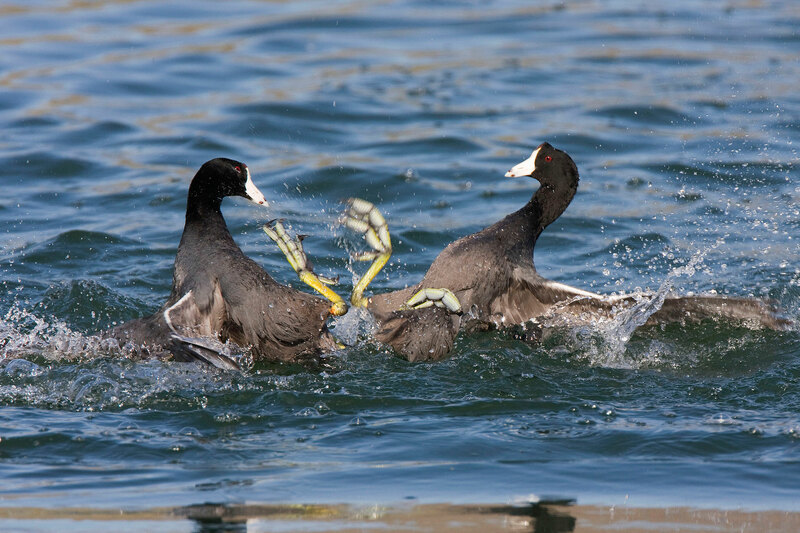 Here are two coots fighting. Pretty crazy feet, huh? No, they are not webbed like other ducks. They are, well, odd ducks. 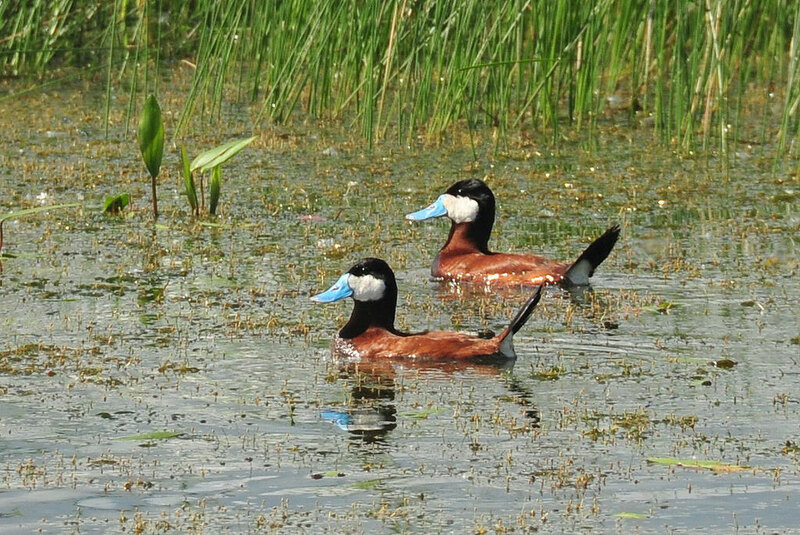 And what's not to love about ruddy ducks with their blue bills and perky tails? Really, that's just a start. 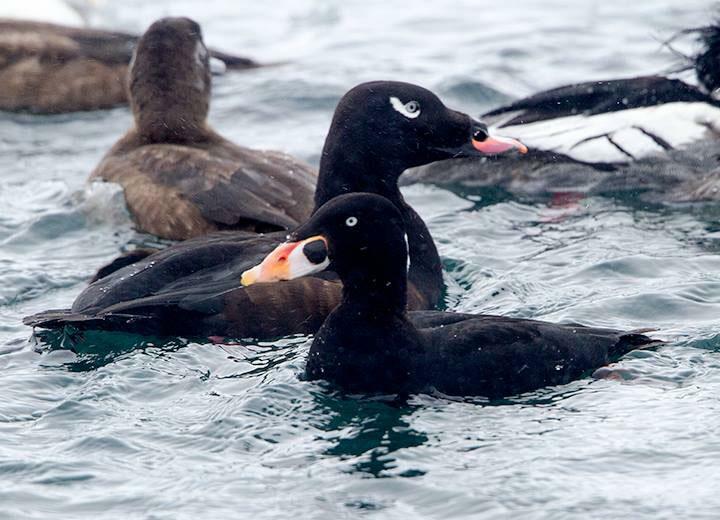 If you get super lucky, as we have a few times in that past couple of years, the more rare and dramatically plumaged harlequin duck or an Eurasian widgeon may stop by. Or a loon or some tundra swans. Here's an elegant common loon. My personal favorite is the surf scoter with its oversized, clownish bill--he's the one in the front. Who could not get a kick out of this bird? Behind it is a white-winged scoter, identified most easily by the "comma" around the eye. It is not all pretty feathers and beaks, though. You can tell that common goldeneyes are flying over if you hear their wings whistling. Hear that and more goldeneye sounds here. Admittedly, the gulls are less impressive, plumage-wise, and telling them apart takes a trained eye and the desire to do so. Even some birders yawn when gulls come up. 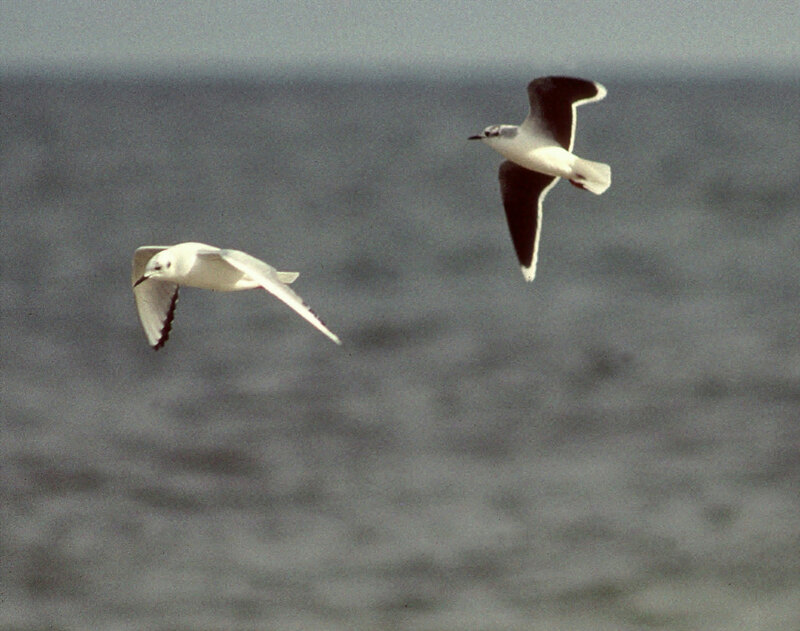 But the thrill of finding a little gull (its name not its size) in a large flock of "regular" gulls cannot be underestimated. See those dark underwings? That's what you are looking for. The bird to its left — without dark underwings -- is a bonaparte's gull, another small gull that comes here in the winter and spring. Oh, and just in case you were wondering, there is no such thing as a seagull. There are different types of gulls, none of them named sea. Please remember this. And if you want to read about what is being seen currently, you can go to the bird report section of the website. So take a look around the next time your wander near the bay or lake. You may just find that not all ducks are the same. 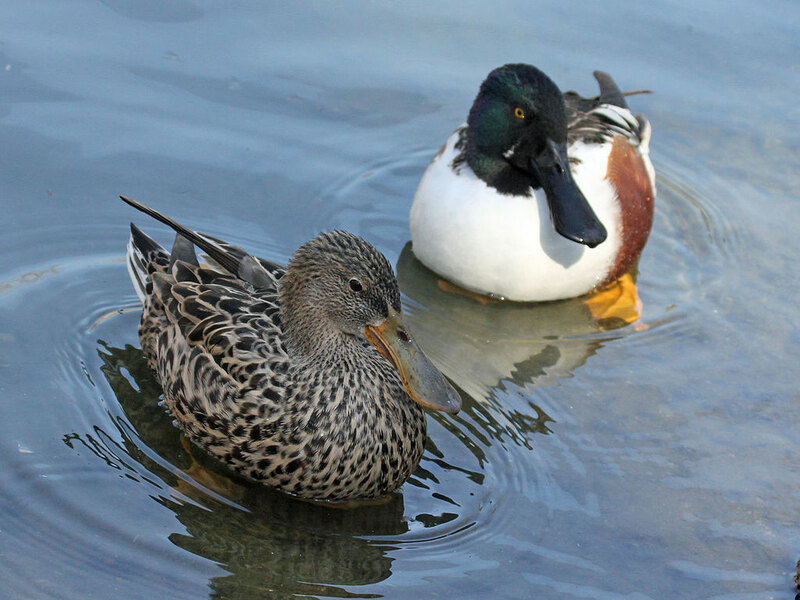 And you may just see northern shovelers like these. How's that for huge bills? With all these gorgeous birds right at our doorstep, you could go a little loon-y. Sorry.